Do you feel an urge to better understand life? With these questions, you are sensing the larger picture of life: Each generation is born into an existing world reality, a zeitgeist. But, history shows that human reality progresses over time. When we find our soul’s mission — that truth that is ours to give others — we participate consciously in Human Evolution. We take part in bringing human consciousness to a greater state of unity, spiritual awareness, and truth. Ultimately we can solve humanity’s problems and bring about a unified golden age on the planet. It may seem as if humanity hasn’t been going in a positive direction for years, even decades, but I believe we can still see a positive shift taking place — especially concerning how we are learning to accept others of different cultures and religions. 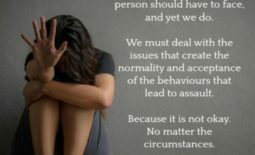 Although some people are warring out there, most of us are acting to resolve such tensions. We know we are here to make the world better. Each of us is on a spiritual journey toward finding our true mission, and we usually go through understandable stages. Knowing these stages can give you a sense of where you are at any one time. For instance, a key time in everyone’s life is the passage through thirty. Thirty is a point where we say, “The human economy is more complex than I thought, so I have to find a place to make money, even if its not exactly what I want to do.” It is at this stage that each new generation looks around and realizes there is a lot that’s wrong with human society that needs to be improved. This more realistic stage is often the beginning step in determining our missions. The next stage occurs around the age of thirty-eight. This is when many people realize that while they may have achieved success in life, they aren’t doing exactly what they want to do. Forty is just around the corner, and we feel that life is short. We want to find a more inspired and fulfilling life. There is a renewed urgency to find our mission. Over the next two decades, more people than ever discover their souls work. Everything seems to come together in a new clarity of who they are. Yet, there is one more “Step.” Somewhere in one’s late fifties to early sixties many people enter the last stage. This is a time when we enter yet another key period in our lives. We begin to slow down in our careers and move into a period of “legacy thinking.” We ask ourselves, “What will I be remembered for.” This is the point in life where we dream of newfound freedom, not just concerning our careers, but also our personal lives. It is at this time that we may get another step us in clarity about our missions. There is often a feeling that there is something else to do with our lives. Sometimes in the freedom of retirement, we see our real mission for the first time. Obviously, the message is clear. Although our sense of mission naturally evolves throughout life, our souls yearn to discover a basic mission as early in life as possible — and then perfect and extend it over time. To discover our missions, we must gain spiritual clarity by becoming mindful of the breadth of who we are. We can’t find our soul’s mission with our logic alone. We must become aware of our intuitive thoughts, and gut feelings that lead to the opening of our perception of Synchronicity. Remember that you are guided through life. Be practical but also be bold in your search for what you are supposed to do. Since there are many options out there, it is critical that you don’t get locked into only one course of direction. The options are as wide as we can discover. You may often think you can’t do something which may cause you to resist the path you are meant to be on. You must find the courage to listen to your intuition so you may act on your deepest urges. 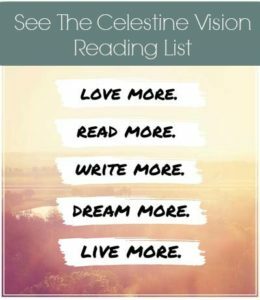 I suggest you read about and explore the many different ways that other people are achieving success, so you can explore all your options and find the one that sparks your souls desire. Your research and observation will help you to broaden your perspective, and that’s key in finding your intended mission. Also, pay attention to all your past experiences because your life has already prepared you for your mission. Synchronicities have occurred throughout your life that you may have missed at the time. 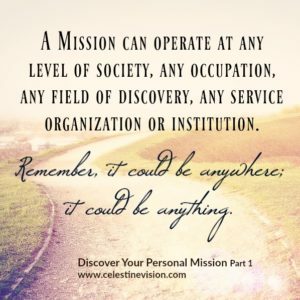 Remember, finding your mission is a detective story into your life and vision. We must discover clues to follow. One of the chief ways of getting clues is to take some time to review all the mysteries of your past.